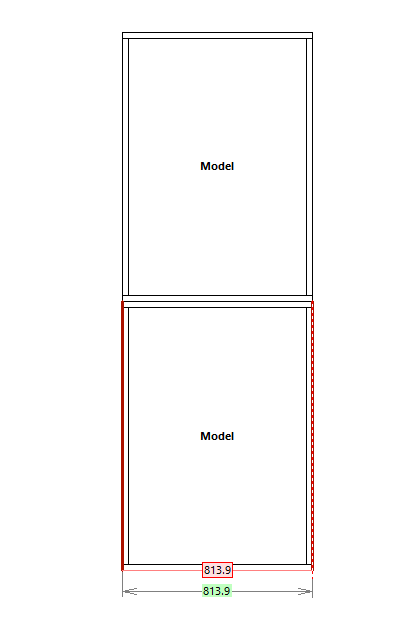 Polyboard will not give “false” dimensions, it’s more likely that you are snapping to ambiguous edges. Can you post you project to the forum? 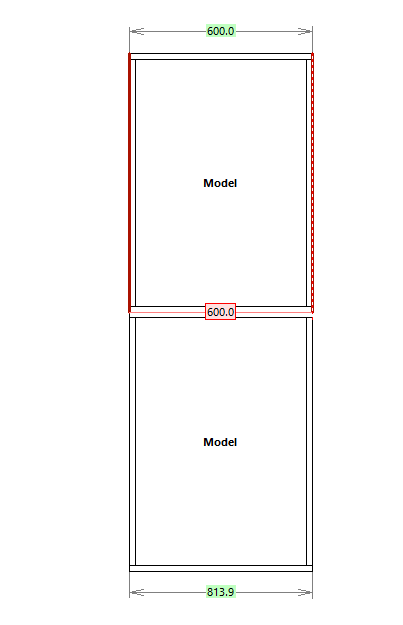 To avoid doing this use the iso view to get the dimensions in the correct planes. I did all that but it gives me weird dimensions. 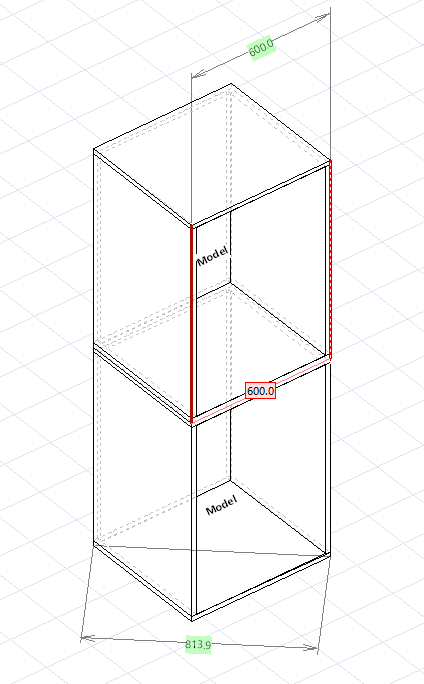 I have designed a wardrobe of 2650 in total height. Tall carcass 2000 high, 600 deep, 1095 width and then I have another carcass on top to create the height of 2650, 650H, 600 deep, 1095 width. 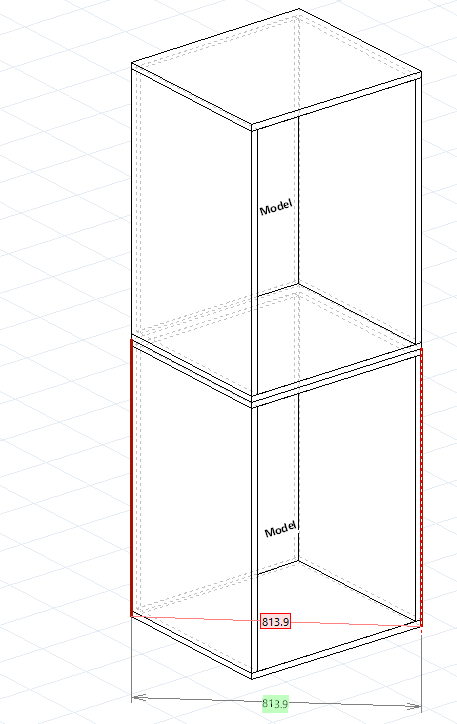 when I measure the top is correct but when I measure the base tall carcass then it changes to like 1426? when I remove the top it’s fine, the tall carcass is correct? Ness with the mesuring tool when we do menualy to add where to show it gives me wrong sizes? i have tried on few different caninets and it does the same. lets say i have one tall cabinet and one smaller that goes on top. both same width. the top shows correct and bottom with 200mm more? You can change individual part colours by selecting the part and changing it’s material. To design for a specific customer and retain the design options make a copy of the existing libraries to a customer specific folder. To do this go to Tools>Folders>Parameters and select a new client specific folder for the materials library. 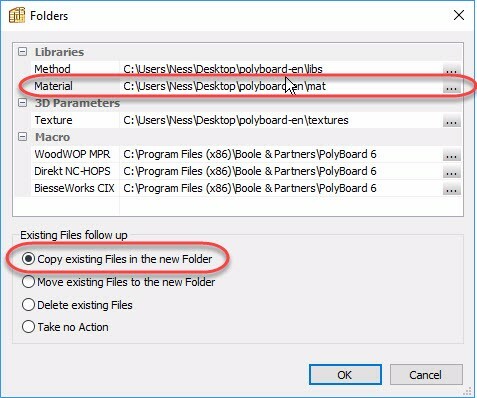 Tick “Copy exisiting files in the new folder” and then click OK.
Polyboard is now using the copy of original materials library and every time you point it to this folder you’ll get back the material colour that you set for this client. To change the colour on the fly you can use either Quick Design panel specific materials or Quick Design material types ie. egger, generic, wood, etc. If you would like to have a mini-training session on design and using our libraries please sign up for full membership. With full membership you can ask for free mini-training sessions, personalised videos etc. Note that when you buy a full version of the software we will give you a free hours introductuary training session too. Is there a way to change colour on doors and drawers just for individual projects, instead of changing in the library which changes on all? As I show to clients I need to change the colour of the doors they like? On your blog you have Polyboard 6.03f but when you download and install it says 6.03e ? what am I doing wrong?